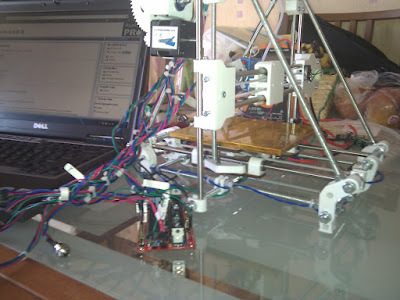 Wires, wires, wires...who doesn't love a bit of wiring? 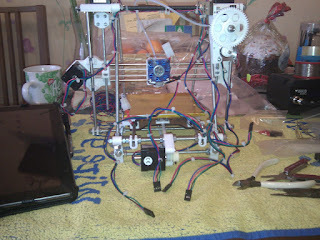 OK, my partner ("Oh...thats a mess, you WILL be tidying it up"), but I quite enjoy the wiring stage. Things to remember here are, make all the wires long enough, so plan where you intend to mount the electronics first, and cut your cables all longer than necessary. 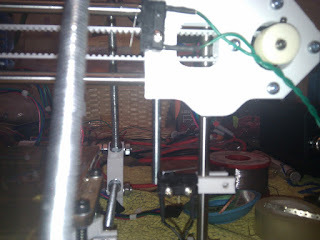 Electrically, this is a pretty simple beast, and the only gotcha's I can see are the well documented end-stop cables, which must be separated from the motors wires to minimise cross talk and false stepping when printing. 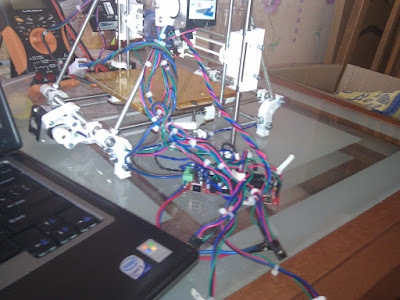 All of my wiring currently is temporary, I've bought a bunch of new Molex connectors, pins and braided sleeving in preparation for the final build, but to get it all working I've just resorted to cable ties and a bit of a mess - lovely! The aforementioned end stops - I've included a couple of pictures here to show placement as there seems to be a lot of confusion over where they go. 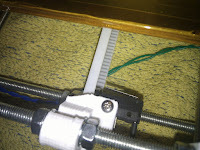 Please note that my Z stop height is not set in this picture - I can't do that until I've levelled the bed. 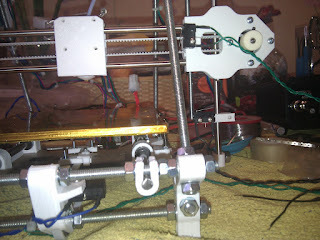 Also, now that the Y end-stop is properly mounted, I can see that my cable clip idea is going to need a bit of modification to work properly - I'll probably either build it out a bit, or bend out the switch contact - currently it's about 2.5mm too short to make contact before the sled hits the end of the run. 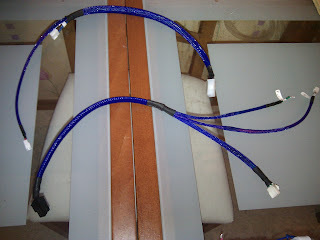 Don't forget to twist your end stop cables - this helps minimize the cross talk and other interference. It's also a good idea to use different colour wiring on each of the stop switches to help identify them later. 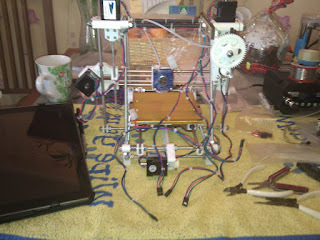 Cable looms for the hot end and bed. Initial connections. A quick note about the power connector - the build instructions state that you only need two power wires connected, and that the third pin on the power socket can be excluded. 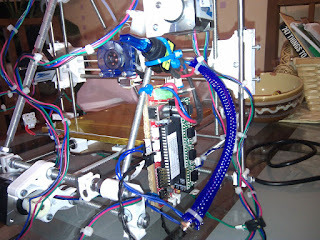 It hints that you may want to bridge the two outer pins to cut out any ambiguity of the polarity - the fact of the matter is though, the third pin MUST be connected to ground or you won't get any output from the PSU, so go ahead an bridge it. Kind of obvious...but don't plug it into the board without checking output and polarity with your meter. Unimpressive pops of capacitors and puffs of smoke don't make anybody happy, so check first! You should get a nice steady +19v from the supply when you plug into the power connector. I decided that the cables looked untidy and I'd previously bought some braided cable covers for another job which where not used, so I threaded my various cables up with this. 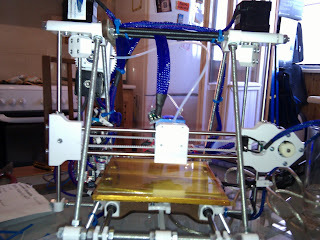 So the cables all look a bit tidier - I'm still fiddling though, as I think it could still be neater. 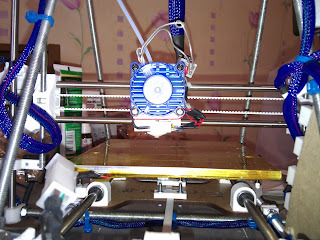 I hit a couple of snags during this - I noticed that both the hot end and bed connectors fouled movement on occasion, so both of those will need to be tidied up, initially with cable ties and eventually I'll change the connectors to lighter and smaller versions. 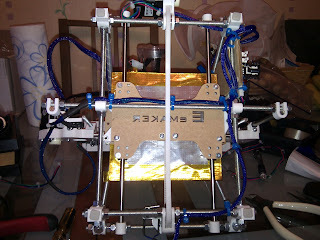 The braided cable wrap I used also reduced the slack of the wires, particularly on the hot end and bed where they are required to move, so I made these considerably longer than originally specified so that I could anchor them leaving suitable play. 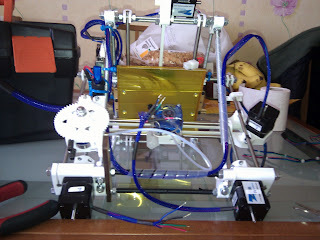 I decided to mount the Sanguinololu (back right of the machine, under the extruder motor - this was a mistake which I'll need to change. 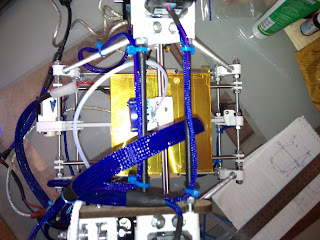 For one, once the cables are all connected to the board, they tend to get in the way of the X-Axis movement (due to the braid again...) so I intend to move the whole assembly to the front right. 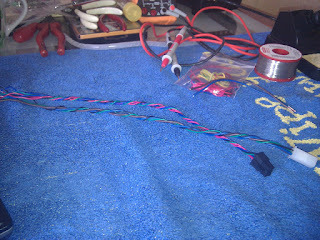 This will mean extending some of the wires, undoing all my nice braid...why did I bother? Ah well, live and learn!